I know for certain that the bottom photo is a widow spider. 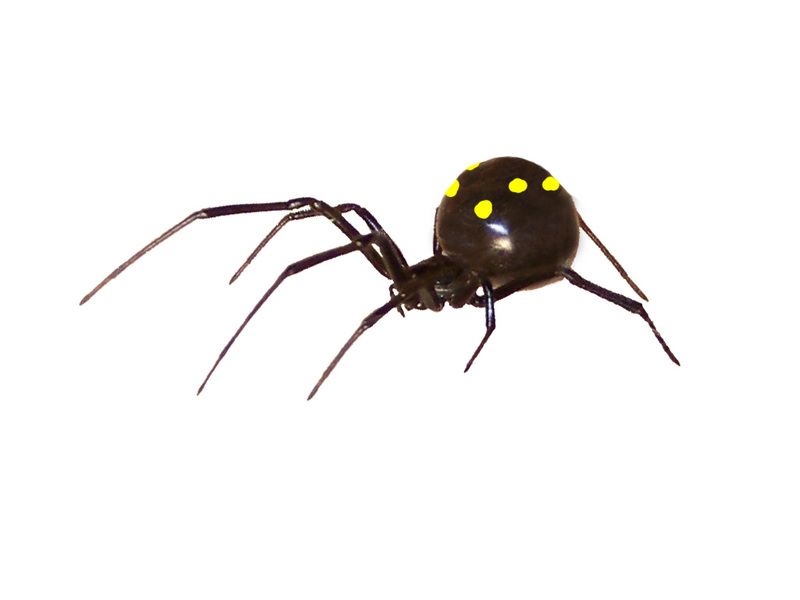 If you saw a black one like that, with yellow spots, you saw a black widow. Black widows only sometimes have the red or orange hourglass marking, that people always associate with black widows, however, black widows can be black, red, brown, or a mixture of all those colors (reddish-black, reddish-brown, etc.) and can have yellow or white spots, stripes, bands, etc. One of the most distinguishing features of the widow is the shape, the lack of hair, and the sheen. This information was shared to me when I talked to Kevin Hoxsley at the Ottawa County Health Department's Environmental section. He is the spider specialist, and was very helpful in identifying the widows I have in my mud room. I have sent you some photos through email. My name is Brittany and I live in Higgins Lake, Mi. I work at the South Higgins Lake State Park and I believe I have found the bottom, brown/burgundy spider before in my Explorer Guide Shed. I have seen at least two - and I will be on the lookout for another one - if I can find one - I will gladly send you a few pictures! I found the top one right now but it's small! It killed this big spider the size of a dime within seconds!! I bet it's a baby! I'm in three rivers MI BTW. Hello from Eden, North Carolina. A few weeks ago I saw the wanted #1 (yellow spots) and was online today to try and discover if it was a widow and thus hazardous. I Googled photos for "black widow yellow spots" and out of dozens of photos yours I recognized. Oh man. I hope Shawn Marie isn't right about that... I found something that looked like the first one in my truck about 7 years ago - I live in Warren, MI. It scared the crap out of me, because all of a sudden it was there on the passenger seat. I pulled over but by the time I'd parked it had disappeared. This is the 2nd spider i found in my flower garden! The 1st one was bigger than a quarter it was black w/yellow stripes...the 2nd one was the same color but double the size....ithey r killing my flowers! The one got away and now i am freaked out! I live north of Armada, Mi. Are they dangerous? I wouldnt be able to tell you if they are dangerous unless I could identify them correctly. If you can get a pic and email me it would help a lot. I really would like to email a pic to you a pic of a nasty, scary, and just plain out creepy spider! Neither myself or my boyfriend know what type it is and some assistance would greatly be appreciated if anyone know what it is. Sara, I have an email address listed near the top, just a short ways below the Header in the middle. You can always send your pics there and I will try to identify them. I get a few every day. Unfortunately, I dont get the time to answer emails every day, so sometimes you might have to wait up to a week for a reply. Sorry about that. I really dont make much of anything from this site. I do it strictly to help people. So I have to work a lot of hours to survive. I have found the spider in the bottom picture, they are in my basement and in my barns, I live just outside williamston mi which is just 20 min. east of Lansing on 96. If you have these spiders, could you please try and get a clear picture of one and email it to me? Hi, I believe I have seen spider #1 possibly about 3 years ago we had a pair that created a nest above my parents hose faucet outside. 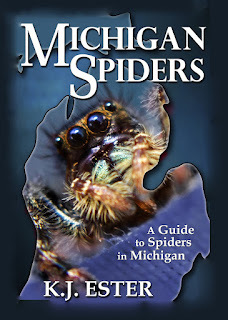 They were the largest I had ever seen in Michigan My parents live in a little country town outside of Cascade/Ada Michigan they were with the legs about the size of a half dollar if I remember right. They had. Bright orange and yellow on their backs like an hour glass almost, and white dots on the sides but the body seemed to be less of a noticeable bump. It more went with the flow of the head. I have looked everywhere as well and have never found any comparable. If anyone has ideas or if this matches you sighting I'd love to know!!! My dad killed them both and we never saw them again. I also thought it VERY odd for two to be in such close proximity of eachother. Only maybe 12 inches away from eachother with seperate webs and about the same size...any explinAtions for that as well?? I am originally from Ukraine. In area wen I used to live (Kyiv region) officially no widow spiders, but I remember that when I was 12(years old) I so the#1 spider. I know that this information maybe useless for you( due to geographical situation of the Ukraine and it was about 25 years ago.) but this creature amazed me. I didn't scare of spiders before I met this one. I never saw spiders as big as this one. The size of it's body was about 2 cm in diameter, and has color and shape of a small round chestnut seed. It was brown and very funny and unusual looking spider with four yellowish dots.First I am even didn't believe that is real. From far it looks like some insect caring chestnut seed. When I recognize that this is a real spider I was sinking that it is mutated spider( the nuclear radiation at at that time was a bit higher than normal due to Chernobyl disaster). I do not why, but very fist time I scared of spider and kill it. I ask my biology teacher about what I saw and she didn't believe me .Later on (till now) I am searching everywhere (library, internet, book shops, magazines,newspapers) trying to find out what exact spider it was an was it dangerous for me. Good luck on you mysterious spider hunting. hope you will get a proper photo soon. I have one right now, and it's alive in a jar. It looks just like a black widow but it has no hour glass and the abdomen is burgundy. I', in Yucca Valley, California. i saw the brown spider with the 6 dots today at my moms house in North Carolina. your pic is the closest thing on the net that i can find that looks like it. wish we knew what it is called.. I Have one captive now!?!??!?!?!?!!!??!? I have caught one of these in my house, the burgundy one without markings. Couple questions. What type is she? Is she venomous? And should I look for egg sacks around her web? She is a rather healthy specimen in a jar at the current moment. Is the burgundy one Steatoda grossa?